I love yogurt and have been eating it since I was a little kid. 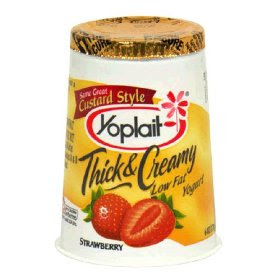 It started with Yoplait custard style yogurts when I was little because fruit on the bottom used to gross me out. I remember coming home from school and peeling off the wrapper of a Yoplait and devouring the smooth yogurt in seconds. In college, I still ate yogurt but because I was more health conscious, I would look for the yogurts with the lowest calories. Little did I know at the time, that often meant they were full of chemical sweeteners. I remember trying a Dannon one time after they did something to get the calorie count from 100+ to 80 or 60, and it made me gag it tasted so badly of chemicals. I haven't eaten Dannon since, but I would still bounce back and forth between other brands of fat-free yogurt just depending what was on sale, until the Greek yogurt craze started to take off. I was slower jumping in that bandwagon because Greek yogurt is so different from normal yogurt, but now I eat Greek yogurt almost exclusively. However, when Stonyfield offered me coupons to sample their fat free organic yogurt (non-Greek style), I was willing to give it a try. I liked the idea of eating organic, plus, Stonyfield's fat free yogurt doesn't contain any chemical sweeteners. That was a big seller in my book. I tried two flavors, SuperFruits (which contains pomegranate, rasperry and acai) and Chocolate Underground. I liked the light, fruity flavors in SuperFruits, but the chocolate was definitely my favorite. It was just the right amount of sweet for a mid-afternoon pick-me-up. I added two small scoops of peanut butter to add an extra bit of protein and the chocolate/peanut butter combination was perfect. While for the most part, I will probably still choose Greek yogurt, I like knowing there's an option for non-Greek style yogurt that is good for me and still tasty. To enter, just leave a comment below telling me your favorite brand and flavor of yogurt. I'll pick a winner next week when I get back from vacation. The Stonyfield coupons are only valid at U.S. stores. Apologies to my international readers!